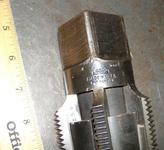 2.5 or 2 1/2 inch NPT PIPE TAP, HSS, MTD, GREAT COND. For sale is a 2.5 in NPT pipe tap. Made by MTD. This tap is in excellent condition. All teeth are sharp and intact, no chips etc. I am not even sure if it was ever used. High speed steel.